Trademark registration Hungary - Hungary is a member of the Madrid Agreement and the Madrid Protocol. Trademark protection is obtained by registration. It can also be acquired by sufficient public recognition. A trademark application has to be filed before the Patent Office by a local agent. A non-legalized power of attorney is sufficient. Foreign applicants do not need a domestic registration. The application process includes a formal examination and an examination of distinctiveness, but no search for prior trademarks. It takes approximately 12-18 months from first filing to registration. After registration the trademark is published in the “Szabadalmi Közlöny es Vedjegyertesito”. The opposition period is 3 months from publication date of the application. A trademark registration in Hungary is valid for 10 years and starts with registration date. The registration is renewable for periods of 10 years. NATIONAL REGISTRATION: If you just want to register your Trademark in one country, it is sufficient to apply for a national registration at the local trademark office. EUROPEAN UNION (COMMUNITY TRADEMARK): Since this country is a member of the European Union, Trademark Protection could be obtained by registration of a Community Trademark (CTM), which is valid for a period of 10 years in all countries of the European Union. INTERNATIONAL REGISTRATION (MADRID SYSTEM)*: If you already have filed a trademark application or have a trademark registration in one or more countries of the Madrid Union (based on the Madrid Agreement and Madrid Protocol), you can obtain trademark protection by filing one single application, so called International Registration (Madrid System). *Note: The fees for an International Trademark Application (WIPO) will be calculated for each individual country or multiple countries. For a quotation please send us an e-mail with the name of countries where you currently have a registration and all preferable countries where you wish to extend your trademark protection. Duly note, if the trademark has not been used within 5 years from registration or has not been used later for 5 years continuously, it may be subject to cancellation. Subsequent use of the trademark can restore protection if no third party has applied for an identical or similar trademark in the meantime and if no party has requested cancellation due to non-use. Do you want to know more about our services or do you have any questions? Contact us directly on: +31 - 88 130 9400 or let us call you back. We found Trademarkhost to be very prompt and professional in everything they do and keen to grasp and fully understand our requirements. Not forgetting to mention, their ability to deliver at a competitive price. I am very happy that I have chosen Trademarkhost. The communication with the Trademarkhost attorneys has also been very pleasant. Every time you call or contact them, they are prepared to help. Trademarkhost is well skilled in everything trademarks. They were always there to answer my questions during every step of the way, simply great people. Trademarkhost gave me and my business the chance to focus on what we do best. Trademarkhost did a very good job at expediting our trademark registrations in the EU. I was really satisfied with the service and activity of Trademarkhost of performing a trademark search and on providing recommendations and estimations. I’ve chosen Trademarkhost as our worldwide trademark representative because they always gave me immediate and professional response with regard to all my questions. They were efficient and responsive in handling our trademark matters, and always provided us with positive and sound advice, which shows their professionalism and experience in this field. Worldwide trademark protection in more than 120 countries. 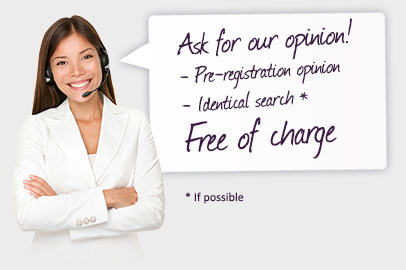 Free opinion on registrability & Free identical searches (if possible). The best fixed fees & no hidden costs. Your own personally assigned trademark attorney (contact person).